These grandiose structures have become the iconic symbol of nuclear power plants though they are used in other applications and are not always present at nuclear facilities. Hyperbolic Cooling Towers – Cooling Tower Systems, Inc. While mechanical draft cooling tower systems are sometimes designed to appear hyperbolic, true hyperboloids use natural draft to draw air into the system which is then used as coolant. Natural draft towers, however, necessitate a very large tower structure which often translates to very expensive construction. Despite the initial cost, hyperbolic cooling towers are one of the most cost efficient industrial towers available. The design allows for minimum usage of material without sacrificing structural integrity. Likewise, natural draft itself eliminates the cost of running the fans needed for forced and induced draft cooling towers. Coal-fired power plants, nuclear plants, power utility and thermal power plants often make use of these hyperbolic cooling towers as the production of electrical energy generates a great deal of waste heat necessitating a large initial investment regardless of design. The shape of these structures is created with one sheet hyperboloid geometry which curves inward at the midsection and billows out at the top and bottom. There are many benefits to this design structure, though it creates large amounts of unusable volume and is therefore more commonly used in purpose driven applications such as cooling towers. Structural economy is inherent in this design as a single sheet hyperboloid can be built with a lattice of straight beams. These are superior to curved beams in both strength and ease of construction. Strength is an important factor as large towers must be able to withstand weathering and high winds. Beams are usually made of stainless steel while the shell is made of concrete fill. The shape also lends to the cooling process itself. Natural draft cooling towers work by pumping the hot fluid upward into the tower. As gravity draws the liquid downward, the updraft of cool air allows for evaporation and transfer of the heat from the fluid to the air, thereby lowering the temperature. 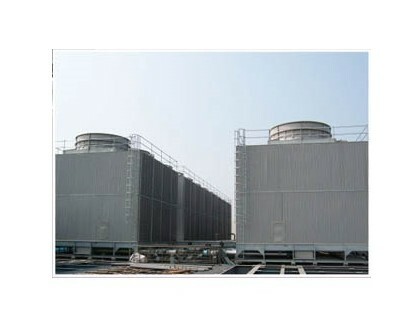 The shape of hyperbolic cooling towers accelerates the influx of air improving cooling efficiency. Despite the durable design and materials, the intermittent dry and wet conditions within the tower make them susceptible to corrosion-induced deterioration that can be detrimental to cooling processes. 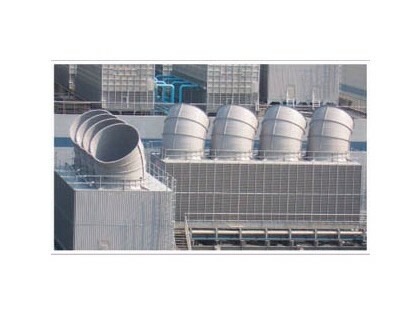 Hyperbolic Cooling Towers The term hyperbolic cooling tower refers to a specific design and construction style for cooling towers that utilizes hyperbolic structural planning that inherently creates natural draft and employs evaporation to cool water and other fluids.